Easy to make with butternut squash, sweet potatoes, apples & warm spices, it tastes like fall in a bowl. This is one of my favorite soups and I serve it every year for Thanksgiving. With butternut squash, sweet potatoes, apples and warm spices, it’s tastes like fall in a bowl. The hardest part is wrestling with the butternut squash, so I call for pre-cut butternut squash to save time and effort. Enjoy! To begin, melt the butter over medium heat in a large pot and add the onions. Cook, stirring occasionally, until soft and translucent, about 5 minutes. Add the butternut squash, sweet potatoes, chicken broth, salt, and pepper to the pot. Bring to a boil, then cover and reduce the heat to low. Simmer until vegetables are very tender, about 15 minutes. Add the diced apple and honey. Stir in the cinnamon, mace, nutmeg, and heavy cream. Bring to a simmer, then taste and adjust the seasoning if necessary. If you like a sweeter soup, add more honey. To thicken the soup, simmer over low heat until desired consistency is reached. Melt the butter over medium heat in a large pot. Add the onions and cook, stirring occasionally, until soft and translucent, about 5 minutes. Stir in the cinnamon, mace, nutmeg, and heavy cream. Bring to a simmer, then taste and adjust the seasoning if necessary. To thicken the soup, simmer over low heat until desired consistency is reached. Note: This soup thickens as it cools. If necessary, add a bit of water to thin it back to desired consistency. What a lovely fall/winter Soup! Both savoury and sweet and a beautiful colour. Thanks for something different and delicious, Jenn! I did freeze half of it and when heating up the defrosted soup, I just needed to whisk it and it all came together beautifully. I like to serve puréed soups in shooter glasses as a hot appetizer as well and this one was popular with my guests! I added a small dollop of sour cream on top after filling the shooter glass almost to the top. Let your guests know that the glasses are warm but it sure tastes yummy! Love the soup! Hubby and I are making it for the umpteenth time. We buy a whole squash and he is in charge of cutting it up. If I am expecting vegetarian company, I use vegetable broth. Love this soup, it is my favorite. There is only two of us, so when I make it I follow the steps all the way through but do not add the heavy cream. I then freeze portions for two. After defrosting and while reheating I add the heavy cream. Perfect consistency every time. This is my go to soup for Thanksgiving and Christmas entertaining and to warm the body on cold days. Plus it is a good way to use the butternut squash we grow. Awesome soup! My comfort food for the winter. Great recipe. Tried a Campbell’s version and liked so I had to learn how to make it. You recipe was awesome. Replaced the mace with celery seed. Turned out great. Now I have a go-to for cold weather soup. Could I use Better than Boullion lower sodium chicken base or a combination of the above with College Inn Broth? Sure (and you can add more salt to taste if needed). Enjoy! Easy and delicious! Always what I am looking for in a recipe. I didn’t add as much heavy cream as recipe called for and added some sage. This is a delicious soup with interesting flavors but it’s definitely sweeter than I anticipated! Though I should have realized looking at the ingredient list. Next time I will make it more savory. Fantastic soup!!! This will certainly be a recipe that I use often. I did substitute a 13+ oz can of unsweetened coconut milk for the heavy cream to lower the cholesterol content. YUM!!! A friend who sampled it says that it tastes like a fantastic dessert! Made this again for Thanksgiving! Delish! Any suggestions on spices if I wanted to make it savory instead of sweet? Hi Kerrie- glad you like it! In order to create more of a savory flavor, you could add some garlic to the onions when sauteeing them, cut back the honey a bit, and switch up the seasonings; I think rosemary and thyme would be nice additions. Hope that helps and let me know if you make a savory version! Hi there, just a couple of questions: what is mace? and what can be substituted if I don’t find it and will substituting vegetable broth be just as good? thank you for your time and delicious recipes. Hi Sandra, Mace is a spice that is similar to (but a little more subtle than) nutmeg. If you don’t have it, it’s perfectly fine to omit it – it will still be delicious (and vegetable broth is completely fine). Hope you enjoy! Once you add the apples, you don’t have to cook the soup any longer? Yes, that’s correct. Hope you enjoy! This soup was so delicious! I have made both butternut squash recipes and this one is much more flavorful. To be fair, in my prior attempt, I may not have cooked it down to my desired consistency. I made this recipe as written with the exception of using half of the recommended amount of cream. I think one could even get away without using cream if desired. My whole family loved this soup. My (very picky) sister was raving about it. I substituted the heavy cream with the thicker parts of coconut milk, and the spices with 1/4 or 1/2 tsp allspice, and 1/4 teaspoon of ground ginger (plus an extra couple dashes) as I did not have the others on hand. Also used goat butter instead of cow butter due to dairy allergies. YUM Jennifer, I always use your recipes when I know I need something good, and this was excellent. Thank you. What a silky smooth soup! Perfect consistency. I am lactose intolerant so I used unsweetened lite coconut milk in place of heavy cream. I was afraid the coconut flavor may overwhelm the soup but I was wrong! I couldn’t really taste it and it gave the soup a very nice smoothness. Added a little garlic and used a little less honey as the apple gave the soup just the right amount of sweetness for me. I had never used mace before and found the flavor was truly “autumn in a bowl!” I was surprised it made so much so I’m going to try and freeze a few portions. Hoping the coconut milk will freeze ok. Thanks for another great recipe. Next on the list this week….Italian Wedding Soup! 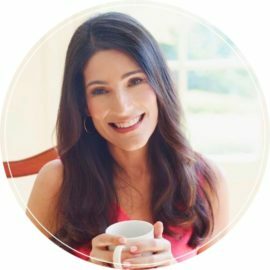 I am so glad I found Jenn and her blog! I made this soup last year for Thanksgiving and it was fabulous! I made it again last week and it tastes a little flat to me — obviously I did something different. Instead of using lower sodium chicken broth I used regular chicken broth and left out the salt thinking that would be appropriate. Could this be my problem? How/can I correct this? BTW — I love your cookbook!! This turned out great! I love the velvety texture and the warm spices. I will feeeze the leftovers to have again. Fortunately, my husband peeled and cut the butternut squash for me. I do not have mace for the squash, sweet potato soup. Is there a substitute for it or should I just make it without? Another question! I want to make your birthday cake in advance. Is it all right to freeze the layers and frost it later? It’s for a surprise party and I am squeezed for time! I absolutely LOVE this soup. I make it every year now for Thanksgiving 🙂 Thanks for sharing!!! This is the most wonderful soup in my recipe box! Easy to pull together and even my picky children love it! I cut the cream in half to make it lighter but the taste isn’t effected. Love Jen’s recipes! Oops! But wonderful… I bought the “squash” at roadside stand and didn’t realize it was a long neck pumpkin til I got home, but I made the soup anyway. Soup was delish! Now I will have to make it again with butternut squash. I’ve been searching for the best butternut squash soup recipe for quite some time now and I seem to have found it. This is perfect. I add a teaspoon of honey to each bowl of soup I pour myself, I like it super sweet but the rest of the house does not. I also douse it with black pepper in my bowl because I like the sweetness and the mild heat combined. This recipe tops the charts! Couple questions here. But first- Love this recipe ! It’s best squash soup I’ve ever tasted! I want to make this soup a week ahead. So I will freeze it. What directions would you change or add if I’m freezing it then defrosting the day I’m serving ? Also does it “go” for this time of year? Or do u recommend more of a summer soup? Ty! It’s for 25 ppl, tripling the recipe should do it, right? Glad you like this soup! You really don’t need to change anything in the recipe in order to freeze it, but if you’d like, you can wait to add the cream until you’re reheating it. Just reheat it on the stovetop until hot. You asked if the soup is appropriate for this time of year — while it’s always tasty, based on the butternut squash and sweet potato ingredients, it’s definitely more commonly made in the fall and winter. If you’d a more seasonal soup, you could consider this Green Pea and Asparagus Soup or this Creamy Zucchini Soup. Hope that helps! Can you freeze this soup??? Yes – it freezes nicely! I would never have tried this combination of flavors, esp. the apple and onions except that Jenn’s recipes are always good. It was wonderful. I am not a fan of sweet flavors, but it was not sweet, just a perfect blend . It was even better the next day. I did not add any cream to this, and liked it fine as is. The only thing left out was mace, because I just didn’t have it. Delicious! Because of a dairy sensitivity we substituted coconut milk for the cream. Enjoyed every spoonful! I just finished making this. I love it! I did not add the honey and I added 1/4 tsp red pepper flakes. I didn’t add the cream since I personally don’t like a creamy soup and it’s excellent without it. YUMMY! I made this delicious soup today. Very, very easy. The flavours are awesome. I wasn’t sure I’d love the cinnamon, nutmeg, honey thought it might seem too sweet for a soup but the flavours are amazing. I followed the recipe except I couldn’t find mace so I just omitted. 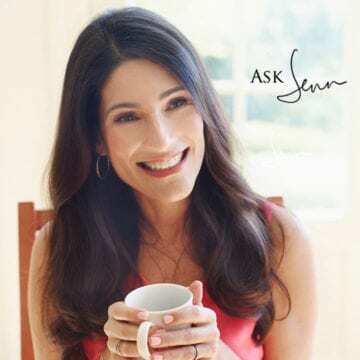 Thanks Jenn – love your recipes!!! This soup is FANTASTIC! Easy to make and even a beginner can impress with this one. I play with the amount of cream at the end, it is a beautiful soup even with a little less cream to lighten it a bit. As always, Jenn doesn’t disappoint! The flavors are incredible. And even more amazing is how they build…first the squash & sweet potato then the apple and last but not least those spices! Oh my word!!!! This is the reason I go straight to this website for all my recipe curiosities. Looking forward to more of this one tomorrow! Yummy yummy yummy! Today was a cold winter day with lots of snow and this seems like the perfect antidote, which it was. I would just like to know if there is a simple way to peel a hard squash like butternut? I put it in the microwave to soften it for a few minutes which helped but wondered if there is a better way to do it. Thanks for the great recipe!! Hi Joan, Glad you enjoyed the soup! I take the easy way out and purchase squash that’s already been peeled and diced :). If you prefer buying a whole squash, I do have a little tutorial with images on the page with the recipe that shows the easiest way to prep it. Hope it helps! Jenn, I love your soups and this one was no exception. So easy… bought the squash already cut up, the onions rough chopped at my local produce market, and followed the recipe exactly as written. I like a thicker soup so I let it simmer for another thirty minutes or so. Perfect! It’s a nasty night and I am sitting here with a big mug of this great soup. Thanks for another winner. 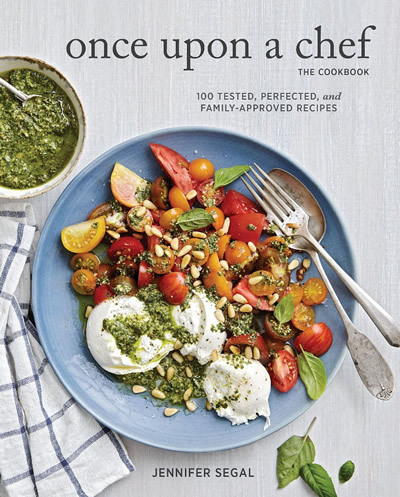 Question, would love an update on your cookbook and I am thrilled with your grana padona (didn’t spell that right) giveaway. Love that cheese. Hi Carol, so glad you enjoyed the soup. (It is perfect for a cold, dreary night!) The cookbook will be released in the Spring of 2018, so still over a year away, but I hope it will be worth the wait :)! This is definitely a keeper recipe for us. I made about half a batch for my wife and I and for the main batch I replaced the Heavy Cream with Almond milk and it came out amazing. Near the end I scooped a large bowls worth out into another saucepan and added some additional spices. I was a bit concerned about the combination i used but I wanted a bit more of a kick to my soup. I added yellow curry, garlic powder, cayenne and cumin and it was amazing a very sweet start with a spicy finish. My wife and i are both thrilled. served it with a vegetarian BLT, and salad. Thank you so much. Have you ever used a cup of cashews to replace the cream in any of your soups? They are healthier than heavy whipping cream. I haven’t Michele, but it’s something I’ll have to experiment with at some point. Thanks for the suggestion! Another wonderful recipe Jennifer. Great flavors! Thank you for sharing the recipe! I found this soup delicious but rather too sweet for my UK tastebuds. I will leave out the honey and apple next time. This soup was also thick and creamy without the cream if looking for a healthier alternative. I made this for dinner the other day and loved it. Going to use it as a starter this Thanksgiving Can this be made ahead of time and frozen? The soup is absolutely delicious!! 5 star!!! Thank you for the wonderful recipe, thanks to you people think I can make a great butternut squash soup. However, I just added a teaspoon of mild curry powder to satisfy my liking for spicy food. BTW I love your website! This soup is fantastic. I have always hated soups which are on the sweet side and only picked this recipe because someone wanted me to cook for them. Well, what a surprise. Guess Ms. Segal has just turned my soup world upside down. Absolutely delicious! What a perfect balance of flavors. Awesome soup. Substituted pumpkin spice for mace and it turned out great. Was a definite hit with the family! Looking forward to trying it again and more of your recipes. I no longer have to go to Panera as often because I can now make delicious butternut squash soup at home! I used coconut milk instead of heavy cream and didn’t have mace. I added minced garlic to the onions. I knew this was a winner when the soup tasted great before adding the spices and milk. This is my new go to recipe during this season. Easy recipe to follow with delightful results. I made 3 batches (had some butternut squash that was nearing a do-or-die point). All of them taste great, though there were some variations. No mace, so I doubled the nutmeg (as others suggested). 1 tsp cinnamon (love that stuff). I ran out of honey after first batch, so I used maple syrup in the last 2 batches…still as yummy as the first. I will definitely make this soup again. I used low sodium chicken stock and half and half instead of chicken broth and heavy cream. I also a bit more honey and a little more cinnamon. Oh, wow! My wife’s comment: Can you make this as an appetizer for our Chtistmas dinner? Absolutely. Thanks for sharing this! Six stars! This is one of my favorite recipes and it has become a staple in our house. For this one, I often use homemade vegetable broth instead of chicken broth (I think it makes the flavors taste “brighter,” but the trade off is that the soup is less cozy, which is fine by us). And, we omit the apples and honey because we like a savory soup over a sweet one. Sometimes we serve it with a dollop of Greek yogurt a few slices of avocado on top. But, seriously, every single recipe on this website has turned out terrific. What a reliable collection of great recipes– thank you for doing all the leg work, Jenn! I love butternut squash soup, so I’ve had a lot of it. This is one of the best I’ve ever tasted. And it wasn’t even torture to make! (I say that as someone who does not relish time spent in the kitchen.) My husband and I cut the squash ourselves (yes, I’m a weakling with terrible knife skills), so the prep took some time, but the end result was well worth it. Since there’s just the two of us, we got leftovers both to enjoy and to share with my mom, who was thrilled. Thank you, Jenn. This recipe will be saved and savored again and again. Did a search because I wanted to make a butternut squash soup for Thanksgiving that included sweet potato and apple. At the last second, I learned one of the guests had a dairy issue so I decided not to add the cream and wow … it was still GREAT. It’s so rich it didn’t even need it! I used veggie broth, and more nutmeg instead of the mace. Five stars — thanks for this great Thanksgiving keeper. It took every once of my being not to lick the food processor blade. This soup is amazing. I didn’t have mace (admittedly had to look it up), so I just added 1/4 tsp nutmeg. Can’t wait to share it with family and friends. Turned out great! I used turkey stock instead of chicken broth and I didn’t have Mace so I used a little extra nutmeg. Yummy! I had a feeling this would work. Seeing your site gave me the confidence to try it. 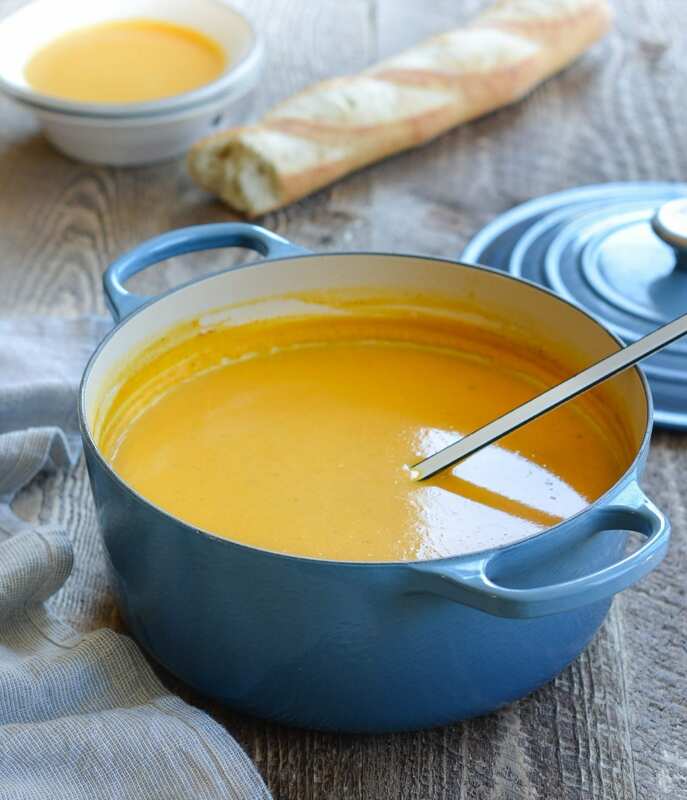 It was really a tasty variation on one of our favorite fall soups (plain butternut squash). Enjoying a cup of this fabulous soup right now! It is so, so, so very good. The best part is that the rest of it is waiting for me in my freezer! Everyone enjoyed this soup…great recipe. Even I couldn’t go wrong. Truly good. I learned some time ago, through trial and error, that sweet potato is a key to a good butternut squash soup! This was a great soup for cool autumn weather. I used a whole squash and it was easy to prep. I only made one tiny change to the original recipe. I used 1 tablespoon of honey rather than 3. This is a huge recipe so I have plenty in the freezer. Very nice soup! Even my little girl, who is often soup- and squash-averse, liked this one. I basically followed the recipe verbatim, using a Honeycrisp apple and all other ingredients except for mace. I also used 1/2 cup of half-and-half (which I had on hand) rather than a full cup of heavy cream, and it all worked out well. Thanks for another keeper, Jenn! Hi Wendy, Any apple will work fine. I just made this and it was AMAZING! I am so happy with how it turned out. This soup is absolutely fabulous!!! Just made it yesterday….it’s a 10 Star recipe!!!! Hi Jenn! I was experimenting with a roasted butternut-carrot-sweet potato soup with sautéed onions, apples and garlic. It was good but needed something more so I pulled up your site- I have made many of your recipes for my cafe, btw (thank you! ), and I love the addition of cinnamon and nutmeg- honey too. Just what it needed. The rest was quite similar to yours! I didn’t have mace. And I also added cream cheese instead of cream. Love your recipes!! This soup was OK, as written. It seemed to lack a flavor component however. I added garlic powder to the finished soup and it greatly improved. I think if I were to make this again, I would add 1-3 garlic cloves to the butter and onion and sauté in the beginning, then follow the rest of recepie as written. Along the lines of the classic French winter squash soup with butternut and acorn squash, I think the sautéed garlic is important to this savory and sweet soup. This is the most delicious soup! I have made orro several parties and everyone loves it. It seriously tastes like Fall in a bowl. The honey adds just a hint of sweetness. Absolutely delicious and didn’t substitute anything. Hi made this soup for a dinner party. It was excellent. One guest said it was the best soup she had ever eaten. Thank you! This soup is amazing. I have found the perfect butternut squash soup after trying many recipes. Made it twice in one week to rave reviews. Thanks! Great recipe, I added a dollop of sour cream and bacon bits to finish. Had 4 at the dinner table ask for the recipe before finishing their bowl..
Just doubled the recipe for Thanksgiving and, naturally, had to taste the soup before putting it in the freezer. It is delicious! Thank goodness I know I will have leftovers. A question, I need to put the calorie amount into my diet sheet but, I notice you say there is 19g of sugar? How is this when there are 3 tablespoons of honey which equates to 63.75g of sugar? Confused, I am! Hi Jacqui, There are 8 servings and the nutrition info is for each individual serving. 🙂 I must have been having a “senior” moment, thanks for the info. The soup is absolutely fantastic! This recipe is fabulous! I did add 3 large carrots and sine I didn’t have mace or nutmeg on hand I used only the 1/2tsp cinnamon but added 1/8 tsp pumpkin pie spice. For garnish, I whipped up the leftover heavy cream with some cinnamon and added a dollop. My always refuse to eat squash kids loved this! Thanks Christa, I didn’t have all the spices either and used your measurements for cinnamon and pumpkin spice 🙂 (though I didn’t add the carrots) still turned out delicious!! Hi Janine, You could do a swirl of cream with a dash of cinnamon or some chopped chives; a crouton; some finely chopped apples tossed with a little cinnamon; or even some pomegranate seeds. Hope that helps! We love it with feta cheese and bacon! I made this soup tonight. It was wonderful! I halved the recipe (I wasn’t sure if would like it) and it turned out great. I tasted it after adding the apple and blending it and thought it was good even before adding any of the spices (my husband liked it too). Adding the spices made it taste like the perfect soup for the holidays. I skipped the cream altogether, didn’t feel it was necessary. Just made this, yummy! I changed the cream for low fat plain yoghurt and didn’t put in the mace. Absolutely delicious. Does anyone know how many calories and the breakdown? I know it’s a “boring” question, but I’d really like to know!. Hi Jacqui, The nutritional facts have been posted underneath the recipe. Hope that helps! Can this be made vegan? Has anyone done this successfully? Hi Maureen, You can substitute vegetable oil for the butter, vegetable stock for the chicken stock and omit the cream; won’t be quite as rich and creamy, but it should still be delicious. Add coconut milk (not water) instead of cream – maybe a bit less – should make it rich – you might not need the honey with this. Wow! Just made this recipe and it is pure perfection. I’ve been looking for a butternut squash soup recipe for a while now and found your site while looking for some other recipes, saw this and had to try it. So glad I did! It’s so easy to make, too. It’s silky, creamy, earthy, sweet and savory. Just what I was looking for. Thank you for this and all your other amazing recipes! Love this recipe as is. It has become a fall staple in my household. Jenn, your recipe for Butternut Squash & Sweet Potato Soup has by far been the best soup I have ever made! Now when I make it, I make about 10 qts of it so I can freeze some plus have some for leftovers, and I live alone. That should tell you how much I love this soup. I’ve made it for friends & given the recipe to friends & they all love it too! I never used to be much of a soup person but you’ve made a soup lover out of me. The combination of the squash & potato & apple with all the spices is just perfect! The cream as you said just makes the soup! I normally don’t use cream in anything & I tried the soup without it & it was delicious but the cream made it so much better! I don’t know what I’ll do in the months when I can’t get squash now. Thanks for all the hard work you do to create these wonderful recipes! Keep ‘em coming! Excellent! I have made other squash soups which were fine but this soup is delicious. My guests will be thrilled when I serve it this weekend. I’m looking forward to trying more of your great recipes. I garnish with fresh sage from the garden. I made this for my grandchildren who don’t like vegetables, they loved this soup 🙂 I topped it with Pomegranate seeds and served with some of our wonderful San Francisco sourdough bread. We all loved it! This is one of those soups that you crave year-round. My family loves it topped with garlic aioli .. This is my absolute favorite recipe! I prefer to purchase the organic whole squash and cut it myself. Butternut squash soup is one of my favorite things for fall and winter, and this recipe is just deliche! I’m already longing for fall so I cam make this. Made it this past weekend and it was a hit! I froze some, so I’m anxious to see how it is once defrosted. Thanks for the great recipe! This is so yummy, and great on a cold fall or winter day. I top it with pumpkin seeds and dried cranberries. Fabulous! I made my first butternut squash soup last week but I would love to try this recipe with sweet potato! So good and so good for you! I absolutely love butternut squash soup and I love sweet potato anything. Never thought about blending the two ~ this is fabulous! A new all-time favorite. Great recipe and even better now that they sell the squash precut! This is one of my favorite soup recipe. I love the sweetness from the squash and onions. So easy to make and I think they are better the next day too. It’s good to make a large batch and save some for later! Delicious recipe! Is there a difference if I use chicken stock or chicken broth in a soup? Carolyn, Vegetable broth will work just fine. Hope you enjoy it! Can you make this with a vegetable broth instead of chicken broth? Erin, Don’t worry about replacing the mace with anything. Just leave it out…it will still be delicious. Hope that helps! What can I replace the mace with? I can’t find mace! Love the pumpkin seeds garnish! Last night I ate some leftovers of this soup and added some craisins to it. Fantastic! It gave the soup a sweet quality with a true fall harvest taste. This soup was excellent! My whole family enjoyed it, including 13 and 10 year old girls. The only changes I made were to roast the squash and sweet potatoes in a 400° oven for 40 minutes, instead of boiling them, and I used whole milk instead of heavy cream. Served it with roasted pumpkin seeds as a garnish on the soup and crusty bread. Excellent fall dinner! your suggestions answered my questions submitted earlier. should have read all the comments first… I am going to try with almond milk with smaller amount of cream to lighten up the fat. And I am going to top with fresh lump crabmeat from our wonderful Chesapeake Bay. This soup is delicious. I had such a large quantity left over when I made it last month that I froze half of it. I was unsure about how such a creamy soup would taste when defrosted, and whether the texture would hold up. This past weekend, I defrosted the remaining portion and heated it up. It tasted just as delicious as it did the day I made it, so yes, you can freeze it. Thanks, Jenn! This sounds delicious and w/ the holidays fast approaching (not to mention the cold weather) I’m definitely going to make this. Debbie: You can definitely omit or cut back on the cream. Don’t worry about adding anything as a substitute…it will be thick enough. Enjoy! I am vegan and am considering substituting coconut cream for the heavy cream. I think it will work with the flavors. What do you think? Thanks! Hi Craig, Yes, that definitely should work. Please let me know how it turns out. This looks great, I’ll try it. I’d like to skip the heavy cream. Would you suggest using a regular Idaho Potato to thicken it up? this soup is AMAZINGLY delicious! the best butternut squash soup we’ve ever had (my dad was here and agrees). I made this soup to bring to a friend who just had a baby and it was a huge hit. I dropped it off along with a loaf of locally-made farm bread. Thanks for an easy, yet elegant recipe. I made the soup and it was fantastic!! We loved it, loved it, loved it! Thanks so much and keep them coming. I love a good sweet potato soup. This seems to be a good combination.